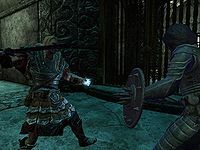 Umana is a Redguard warrior found in the last chamber inside Alftand cathedral. Upon entering the room she will speak to an Imperial soldier named Sulla Trebatius about leaving this cursed place. If you stay out of sight they will start fighting each other, usually leading to the death of Sulla. It doesn't matter which one you kill first, the other one will still be hostile. She carries a unique shield called Targe of the Blooded. Umana wears a set of steel plate armor along with a matching pair of gauntlets and boots. 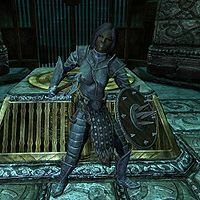 In combat she relies on her unique shield and a leveled war axe, which can be up to Elven in quality. This page was last modified on 7 February 2017, at 03:36.